Water is such an important element in our lives, we can't live without it, just like our Lord and Saviour! It appears in so many places in the Bible, more than I realised. Here are a few examples to get you thinking, Noah and the flood, Jesus' 1st miracle; water into wine, calming of the sea, walking on water, baptisms, fishing, washing/cleansing, rivers, pools etc. Use this inspiration in your next project, and don't forget to leave a comment with details so we can take a peek! Now for the card details! I have to thank a SCS contributor (user name: Zindorf) for inspiring this card. (Do a search for her gallery on Splitcoast, she is amazingly talented!) I first used antique cracking and canvas background stamps to stamp on Always Artichoke cardstock, which was attached to a piece of Basic Brown. I then created a sheet of "homemade" patterend paper by swiping four shades of ink across a piece of glossy white cardstock, using a sponge to blend the colors together. I then used white craft ink to stamp shell images on the colored paper and embossed the images with clear embossing powder. A triangle was cut from finished pattered paper, edged in More Mustard and adhered with antique brads on top of my Always Artichoke. I used a pretty leaf stamp from a retired SU! 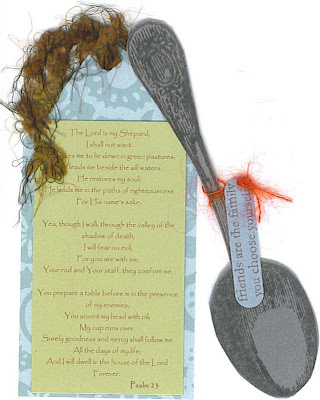 set to accompany the verse, which was stamped on a piece of Basic Gray paper. Lastly, I stamped two shells on the same BG paper, cut them out, and popped them up with Stampin' Dimensionals. Please be sure to visit the SALT blog to see all of the other beautiful creations! And don't forget to leave a comment if you choose to play along...we'd love to see what you come up with! Cardstock, shell, background, and leaf stamps, ink, brads by Stampin' Up! The Just Johanna designer kits will arrive soon (I can hardly wait) but I last night I decided that I just had to break into a my existing JJ stash! 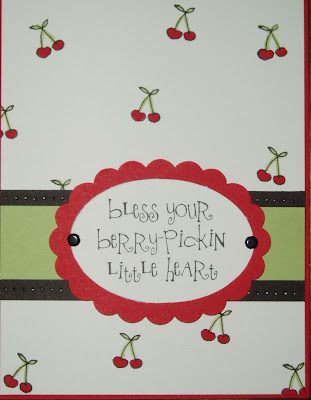 This little cherry stamp and saying is from her latest image release. I've had the idea for this card in my head for awhile now and I was happy with how easily it came together. Super easy card - I love those! Stamped the cherry stamp all over my white cardstock, colored my cherries and stems with SU! markers and mouted that onto Real Red SU! cardstock. Added trim across the middle of the card in SU! 's Basic Black and Certainly Celery (the black has also been pierced), a big 'ol scalloped oval serves as the backdrop to my saying and two black brads secure both pieces together. A little tape to hold it all together and I was done! These were so quick and easy and are sporting such a cute image that I this would be a great layout for a thank you or birthday card gift set. Hum...maybe I'll get to work on that! Ink, brads, cardstock, and markers by Stampin' Up! I'm thrilled, excited, humbled, blessed...you get the idea....to announce that I've been added to the Just Johanna design team!!! This will be a short assignment, just three months, but I couldn't be happier! I adore Johanna's unique images and very fun sayings! The new teams are just getting up and running (soon you'll be able to read more about the rest of the gang on Johanna's blog) and new creations should be posted to team member blogs in the September timeframe. Congratulations to all the other ladies on the team! And if you're not familiar with Just Johanna stamps, get on over to her online store (link above)....hurry....you're going to love what you see! I participated in a swap earlier this week and the challenge was to create a 3-D project for the group. Since I've been painfully pressed for time over the past few weeks, I opted for a quick and easy project. This is a box that Nichole - designer extraordinaire from Papertreyink - posted on her blog a few months ago. (You can find the tutorial here.) It is a breeze to make and super cute! Nichole also suggested making a few of these as nesting boxes - great idea! This is a perfect little box for baby or bridal shower favors and are great filled with small candies. Even sturdy enough to store beads or other small crafting items. These boxes are so fast and easy to make...After making the bottom of the box, which was left plain, I stamped various images on the box top (while still flat, before all the folding) in complimentary colors. I then folded and secured the box top. Now I was left with a small area, about 4" for additional decoration. What could be better than a scalloped circle punch? Punched and pierced my scalloped circle, layered another plain circle; a "popped-up", embossed horse completed the look. The "you and me" is part of a hostess set and that was stamped on a piece of window punched cardstock, that was slide in between my two circles. The ribbon was attached to the underside of the lid and I aged all of the corners with a Basic Brown ink. Total time to complete - about 10 minutes! This week's SALT Challenge comes from Casey and she chose the theme "Life to the Full." Her theme comes from John 10:10b where Jesus says that He has come so we may have life and have it to the full (or in abundance). "My cup runneth over", from Pslam 23, was the first verse that came to mind when I heard this week's challenge so I thought it would be fun to create a paper mug and have it overflow with goodies! I did find this template online but actually ended up drawing the mug freehand. The mug is cut from the Papertreyink white cardstock, which was the perfect weight for this project. The front of the mug is covered in paper from my Provo Crafts giant pad 'o paper and the back, handle, and inside have been covered, thanks to my brayer, with Basic Brown ink. The corners are held together with a few square SU! eyelets (now retired). 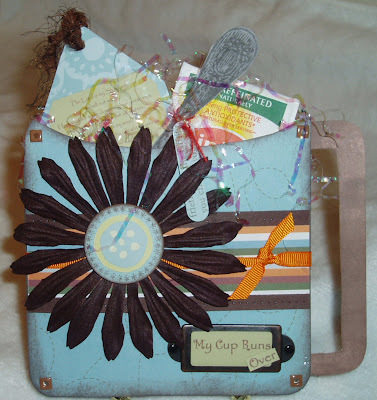 The banding around the middle of the mug was done in Chocolate Chip cardstock and more of the Provo Craft paper. The Chocolate Chip paper has also been pierced on the top and bottom. The giant Prima (aren't these the best) has been attached and the center of the flower is chipboard that I covered. I then used one of the Borders stamps from Papertreyink for the edge and a sticker from the Provo Crafts book for the center. I carried the "cup runneth over" theme on the bottom of the mug and highlighted the text by surrounding it with the metal plate. Now it's your turn!! We were all thrilled with the wonderful comments and contributions left on the SALT blog for our first challenge! How about giving this challenge a try! Visit the SALT blog and leave a comment with a link back to your creation...whether it be a card, scapbook page, or altered object - we'd love to see what you come up with!! Thanks for visiting and have a blessed, "full", day! Finally had an opportunity to stamp this evening and have been dreaming about using my new Just Johanna stamps all day! This cupcake image was perfect for a topper card (I think that's what they're called) and this is the first time I've used this layout. 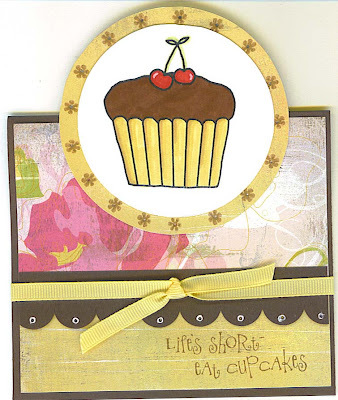 A large image, like the cupcake, is the perfect size and shape for this type of card. And how about the saying? Isn't that too funny? I love Johanna's sayings! I have a nightshirt that reads, "life's short, wear cute shoes." Shoes and cupcakes, what else does a girl need! LOL! My cupcake was stamped in Stazon and colored with SU! markers. I attempted a bit of shading on the cupcake wrapper, which is more obvious in person and small highlights were added to the cherries with my white gel pen. I don't have a large scalloped circle punch, which I would have preferred for the layer under the cupcake but using my SU! cutting system worked just fine. I also added some tiny flowers from one of the new Papertreyink "Borders..." stamp set. The middle of each flower has been pierced as well. The patterned background papers are from Basic Gray. I created a solid scalloped piece, to join my two patterend papers together, by using SU! 's notch punch. Each scallop has been pierced and colored with the white gel pen. Add a ribbon accent and I was done! Chocolate Chip cardstock, ribbon, white gel pen by Stampin' Up! Sadly, I needed to make another sympathy card this week...It's been a tough few months for some of our friends. The design layout is loosely based on a card found in the new SU! catalog. Mine turned out quite differently but viewing the photo was the creative push I needed as I was feeling rather uninspired tonight. I used cardstock from SU! 's new In Color line. One thing I love about SU! is how well all of the their colors coordinate, it makes mixing and matching a breeze! 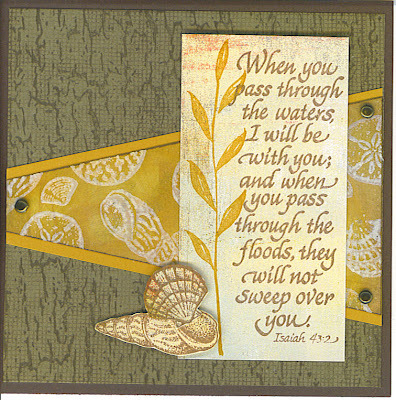 The background image, on the green cardstock, is a combination of a canvas and french script stamps. The sentiment - so fitting for the loss of a loved one - is simply stamped on a very vanilla cardstock square and then mounted on a larger red square. I broke out a teeny tiny corner stamp from my new Papertreyink borders stamp set to decorate the edges of the square. The bee and leaf is from a long retired SU! set, Botantical Gardens, which is still a favorite. Both the bee and leaf have been cut out and adhered with dimensional tape. The leaf was colored with watercolor crayons. I then misted the colored stamp before I stamped to give the image that real watercolored feel. And the botton of the card was finished off with two rows of paper piercing. Cardstock, hardware, ink, watercolor crayons, ribbon by Stampin' Up! These are two quick and easy note cards that I sent to a few customers. I have shamefully not used my Papertreyink stamps lately and I knew that their pretty images and sentiments would be perfect for this type of project. 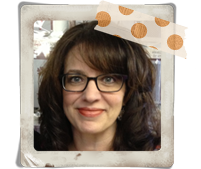 I used pieces of my Stampin' Up! paper pack for the background and whisper white for the top layer. (The finished product is 5" x 5"). My initial thought was to stamp, in a pale ink color, the images to the right of the white paper and then write my note. But I really liked the clean look of the finished piece and couldn't bring myself to write on the top sheet so...I used one sparkly brad in the upper left corner to hold the two pieces of paper together, creating a front cover that swings out of the way to uncover the written message beneath. I then added a tab with "instructions" to find the note, just in case it wasn't apparent. Quick and easy note cards...took about 10 minutes to finish both pieces! 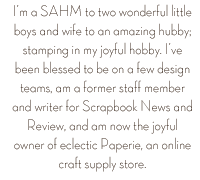 Paper, ink, tab punch, and brads by Stampin' Up! Salt Bi-Weekly Dare #1 - PRAISE!! What better challenge to begin the Salt blog with but praise....Just writing the last post, announcing the launch of the site, causes me to praise! From the SALT blog: "Express your praise to God in whatever way you choose.Praise is such a wonderful word. We give praise to people - especially children when they have done something that makes us proud and pleases us. We give praise to God because he has done everything for us and we are proud to be his children." Webster's defines praise as "the offering of grateful homage in words or song, as an act of worship. " When praise was offered as the first challenge two things instantly came to my mind; 1) Christ's work on the cross and 2) the blessing of my family. The verse I choose, from Psalm 63, highlights why God is worthy to be praised. His love is demonstrated through Christ's work of redemption and in the way that He blesses us with the gifts of children, loving spouses and families, shelter, employment...well I could go on and on! These blessings cause me to sing God's praises and rejoice in His mercy and grace! I found this beautiful glass trey at a my local superstore. Since it had cut outs for photos I thought it would be perfect to not only highlight some favorite photos but to also use some of the panels as a mini canvas. All of the paper used for this project are from Crate, which I purchased at Eclectic Paperie. This particular design is called Crush and I adore it!! All of the stamped letters and images are from various Stampin' Up! sets, as well as the chipboard star, brads, and ribbon. Once I had the design ideas in mind, it was a fairly simple project to complete. I think I spent more time fooling with all of the photos! I'm excited to have the finished piece sitting on my coffee table, where it can serve as a reminder of one reason that I should offer praise!! I heartful, giant THANK YOU to everyone who has visited and/or left comments. I truly appreciate each and every thought!! Stamps, ink, brads, and ribbon by Stampin' Up! The day has finally arrived when I'm able to announce the BIG news.....The launching of a brand new challenge blog!! The new blog, Salt, is comprised of eight designers (and I am blessed, humbled, thrilled - I could go on and on - to be one of the team designers) who met through blogging and are seeking to express our faith through our creativity. Similiar to the Daring Cardmakers site, every two weeks we'll be tasked to create something (card, scrapbook page, altered art) based upon a challenge. Each of the team members will take turns posting challenges and then we'll post what we've created based on the challenge. You'll find links from the Salt blog back to each of the designer's blogs so you can read a more in-depth description of each piece. So...not only are we excited to share our work with you but we'd be thrilled if we inspired YOU to create something to share with US! Leave a comment on the Salt blog, with a link back to a photo of your creation, we'd love to take a peek!